VENDORS WANTED for the July 27th & 28th, 2019 Santa Ana y Santiago Fiesta! Business permits are required to sell food or merchandise at this Town of San Luis' historic celebration. If you would like to be a vendor please download and fill out the application below and return to the San Luis Town Hall to reserve your spot at the 2018 Festival. Tent booths, table displays and vending trucks welcome. Premium booth spots are available for $30 per day. The fee for a Special Event Permit/Vendor Permit is $30.00 for the two days.For questions call: (719) 672-3321. Download SPECIAL EVENTS LICENSE APPLICATION here. Santa Ana y Santiago Fiesta celebrates the Patron Saints of our local churches, Saint Ann (Immaculate Conception Church) and Saint James (The Mission Church), held annually the last weekend of July. Many former San Luis resident’s return to San Luis to celebrate this heritage festival sponsored by the historic Sangré de Cristo Parish. The town has been celebrating this event for over 100 years. Parades, horses, music, vendors and church events take place during this annual two-day weekend festival. This event is held the last weekend of July each year. 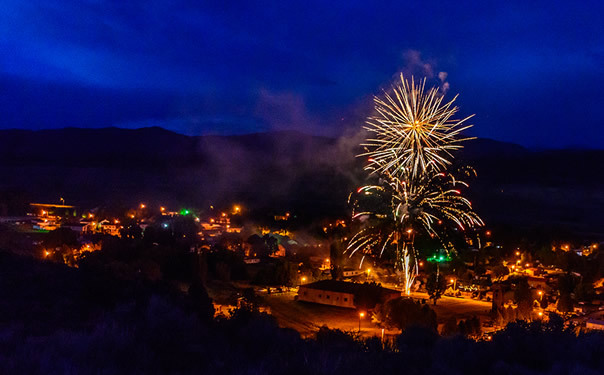 The Town of San Luis and Adelente San Luis will team up for a third annual San Luis Manito Christmas celebration the first weekend of December. In 2017 the town celebrated the tradition of “Oremos” a local tradition over 100 years old. This winter tradition has been celebrated in the Hispanic villages of northern New Mexico and souther Colorado for centuries. It begins in each village with the lighting of one luminaria (bonfire) on the 16th of December. On the 17th there will be 2 luminarias, on the 18th there will be 3, so that on the 24th there are 9 luminarias in each village. This hearkens back to the Jewish tradition of lighting a candle on the first night on Hanukkah, 2 on the second, etc. Until on the 8th night there are 8 candles lit. On the evening of the 24th, Christmas Eve, a few of the older teenagers don masks and costumes so as to not be recognized. They are called abuelos (grandfathers). They make the younger kids sing, march in formation, etcetera – all to the beat of a chicote (a horse whip) around the bonfires. (We pray, we pray. We are little angels. The children are then invited by the owners of the house to sing or recite a poem. And then they receive a treat. The same tradition is done on Christmas morning and is known as Mis Crismes (My Christmas). Join us Dec. 1, 2018 for the third annual San Luis Manito Christmas Celebration!